I've been so careful about not comparing the new Smooth Ambler Very Old Scout 14 Year Bourbon to the Pappy 15 that I think I've been doing it a disservice. True, it's the only older Bourbon we have in stock at the moment, but it's not simply a winner by default. The Bourbon is fantastic. In all honesty, if I had to compare it to something, I'd compare it Pappy 15 because it's the same age, the same price, and it has a similar low 50's proof. They're simply two Bourbons cut from the same cloth. Obviously, there are some differences. The Pappy 15 uses wheat for its flavor grain, the Smooth Ambler uses rye. The Pappy 15 is pretty much 15 years old exactly, while the Smooth Ambler has older Bourbons blended into it. That being said, I feel like someone who likes Pappy 15 would like the Smooth Ambler. I'm not saying they'd like it better, but they might be interested in trying something new, much like someone who likes Laphroaig might want to try Ardbeg. Despite their obvious similarities, I just couldn't bring myself to say that yesterday. Once you throw the Pappy 15 comparison out there it looks like cheap pandering. "Hey, that guy at K&L said he has a Bourbon that tastes like Pappy." I could just see the sea of emails pouring in, accusing me of trading on the Pappy popularity, my credibility funneling out the door faster than Walter White draining methylamine from a freight train. So what to do? Was I so far off in my comparison? There was only one way to find out. I needed to put my best Bourbon boys in the bar for a blind tasting, have them write down their notes, and then talk about what they thought. Again, I wasn't so much interested in which one they liked better, but more if the styles were even comparable. Would they group them together as similar Bourbons, or were they totally different? Bourbon A was the Smooth Ambler and Bourbon B was the Pappy 15. Jim Boyce and Kyle Kurani, two of our best spirits guys at Redwood City went in first. Kyle: Bourbon A has more cocoa, more wood, and the flavors are more focused. Bourbon B has a big honeyed nose with spicy brown sugar. Hot. Jim: Bourbon A is much more focused and the flavors more balanced. Bourbon B has big maple notes, honey, brown sugar. 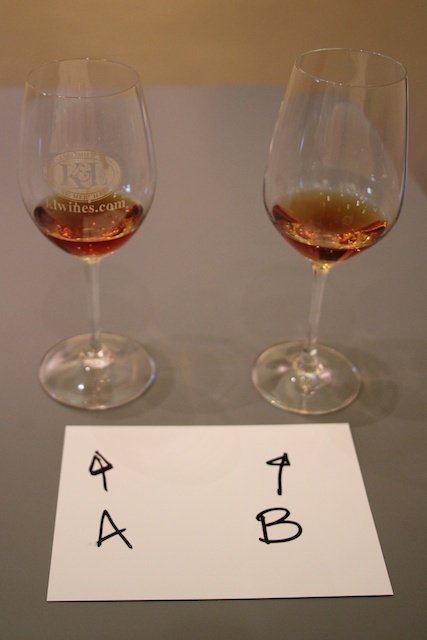 Both guys were able to identify the Pappy as Bourbon B, but thought Bourbon A showed favorably by its side. Kyle and Jim both said they'd rather drink the Smooth Ambler personally, mainly because the Pappy came across as hotter. It does have an extra 3.5% of alcohol, but they thought the Smooth Ambler was more in balance. Next were our Bourbon-drinking customer service guys, Shaun Green and Joel Nicholas. Shaun: Bourbon A has a sweet nose with caramel and grain. It's quite smooth with nice butterscotch on the finish. Bourbon B is less supple on the nose, hot and course on the palate, with a bit of dirt on the back. Joel: Bourbon A starts off rich then dies on the mid-palate. Alcohol comes through. Bourbon B is big, rich, and much more drinkable. This was an interesting dichotomy. Shaun thought the Smooth Ambler was terrific (so much so that he bought a bottle right after) and did not like the Pappy at all. Joel felt the exact opposite. He did not like the Smooth Ambler, but did like the Pappy. "That's good," I thought because if I write an article about a taste test and everyone likes the Smooth Ambler better, no one's going to believe me! Someone had to like the Pappy better for this to have any credibility. I was ready to call it a day when Todd Smith from Pacific Edge walked in the door with some samples for me to taste. I gave him a glass and said, "Go taste Bourbon A and Bourbon B." I didn't say anything else. Todd's been a bartender in San Francisco for years and knows his whiskey well. He walked back out of the tasting bar and said, "Well Bourbon B is obviously Pappy, but where the hell did you get Bourbon A?" "Why, do you like it?" I asked. "It's delicious!" Todd replied. We talked booze for a few minutes and then I sent him home with a bottle of Smooth Ambler under his arm. Todd loved the Pappy and thought it was the better Bourbon, but still liked the Smooth Ambler enough to buy one. Again, I was ready to call it a day when another familiar face came through the door (one who will remain anonymous because I didn't ask him if I could post his opinion). He was actually coming to talk to me about Bourbon, so I sent him into the bar for another round of tasting. Being an experienced taster, he came back and said, "Bourbon B tastes like Pappy. You can tell because it's just so big and intense." "How do you think Bourbon A compares with it?" I asked. "Quite well," he said. "They're both in the same school of Bourbon with similar levels of richness and age. I'd choose the Pappy over it, but I'm still going to buy one of these!" This man also left the store with a bottle under his arm. So now, after debating whether I wanted to say it or not, I feel more comfortable with the comparison. Some people loved it, some people liked it, and one person didn't like it, but not one person found the Pappy comparison out of place. Because of that, I feel I can say that the Smooth Ambler Very Old Scout is a Bourbon that you should check out if you like Pappy 15. If I had to compare it to something, that's what I would compare it to.